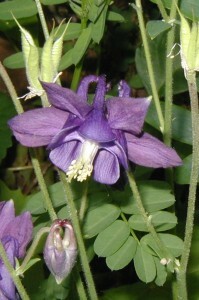 Columbine has an interesting flower with a drooping bell and five long spurs that point upward. The Canadian Columbine, Eastern Red Columbine, or Wild Columbine, Aquilegia canadensis, grows wild around here. Each year we see large stands of columbine growing on high rock ledges where parts of the earth were cut out to make way for Routes 11/15 going North through Central Pennsylvania. 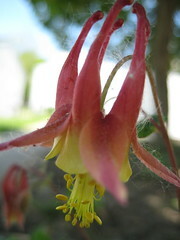 The flowers of this wild columbine are red and yellow. Red outer parts and spurs contrast with yellow petals and numerous yellow stamens which are longer than the petals. Foliage comes up in early spring and lasts through out summer. The shape of the rounded lobes varies among the triplicate leaves that are each divided in threes. Leaves of columbine are doubly compound, which means that the leaflets of a compound leaf are themselves compound. The next two images are of leaf rubbings made simply by placing a leaf between two pieces of paper and rubbing the outside with a pencil. Rubbing over a leaf surface will bring out detail that you might not have noticed by looking at the leaf. At a minimum you’ll get a good look at the leaf edge and some of the leaf veins. 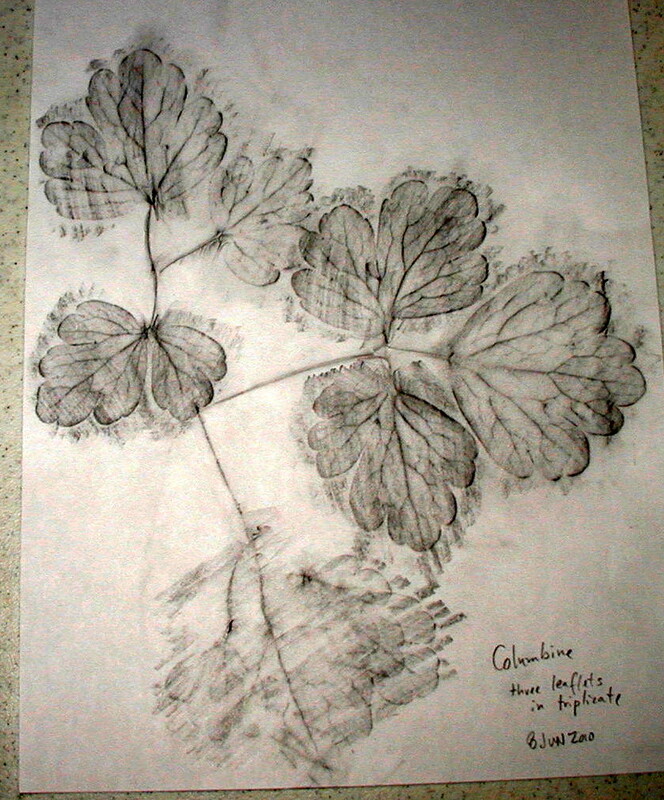 Click the images below for a closeup view of the leaf structure of Columbine. A leaf rubbing of three Columbine leaflets in triplicate. Most leaf edges overlap. Two of three Columbine leaflets in triplicate. Leaves were spread apart to illustrate the leaf and lobe shapes. If you’re keeping columbine in a garden, cut off the flower stems after blooming unless you don’t mine the ragged look of the seed pods hovering over the foliage. Eventually, the flower stems or seed pod stems will bend over to the ground and look unsightly. If you don’t mind that look, just ignore the flower stems and the seeds may feed a bird or two or replant the columbine. 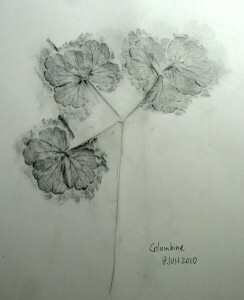 Columbine is a perennial that is easily regenerated from seed. A wild purple columbine volunteered across the road from a house where the same type of plant was observed in a flower bed. Photo taken 17 May 2010. Note the seed pods from previous flowers that are standing straight up. The foliage in the image above isn’t of columbine. Although Native Americans used the seeds, roots and whole plant for their astringent and diuretic properties, Peterson’s Medicinal Plants Guide warns us that Columbine is potentially poisonous. This might not have been surprising if you knew that Columbine is a member of the Buttercup Family, Ranunculaceae, as many buttercups are poisonous!